Love your kids for who they are. Mom and dad, your kids are created in God's image, not your own. 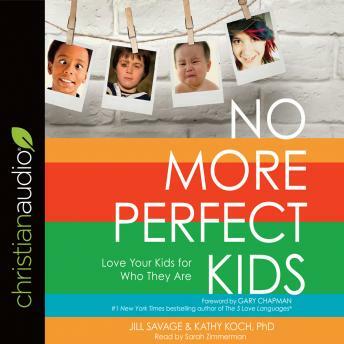 Jill Savage and Kathy Koch will guide you in truly appreciating your kids. They will teach you how to study and become an expert on your children, because you cannot fully embrace them until you truly know them. Identify and remove the Perfection Infection from our parentingRelease our children from unrealistic expectationsAnswer the questions our kids are silently asking in a way that gives them the courage and freedom to be themselvesMeet the needs of our children, including those with special needsWritten in a passionate, candid, and personal tone, the authors will instill within you hope and contentment. You'll be inspired to apply the practical, realistic, and relevant ideas and tactics Jill and Kathy share.